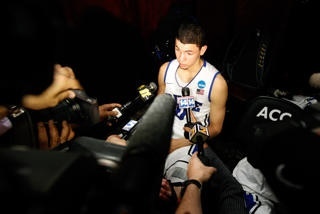 Austin Rivers, Duke freshman guard and son of Boston Celtics head coach Doc Rivers says he will declare for the NBA Draft. Austin will save signing with a agent and forfeit his three remaining years of eligibility. As of now, Rivers is widely regarded as a sure fire lottery pick. Rivers led Duke in scoring with 15.5 points a game and was named an All-ACC performer. Rivers’ defining moment this season came when he drilled a 3-pointer at the buzzer to defeat North Carolina at Chapel Hill. Not a big surprise here. Rivers has “Future NBA Stud” written all over him.